As with every year, Comic-Con produces a random assortment of news items that aren't really big news in and of themselves, but are worth mentioning. So, I've collected such items after the jump. But first, was the official release of the Wonder Woman costume seen above, that Gal Gadot will wear in the upcoming Batman v. Superman: Flan of Justice. And you know what? I like it. I really like it. And I like her in it. She looks like Wonder Woman. Really looks like her. This is exactly what I've always pictured when I imagined what Diana would look like in a live action film. The classicist in me loves that the outfit is actual armour, and that it has a Greek-style skirt, rather than being a one piece bathing suit. I love that it is monochrome and appears to be made out of bronze, as is befitting a Bronze-age soldier. I love that there is no American iconography anywhere near it (other than an eagle, which weren't exactly unknown to the Greek and Thracians, which Amazons were more likely to have been were they real). I love that she both her sword and lasso (in a world where "Superman" doesn't snap people's necks, the sword is important because it symbolizes the fundamental philosophical differences between what she is willing to do compared to what Superman and Batman are unwilling). This is legitimately the first thing to have come out of DC in years that I'm excited about. Make no mistake, I feel that Batman v. Kramer will still be terrible, as there are far too many factors stacked against it: Synder being unable to direct actors to save his life; David S. Goyer being an absolute talentless asshat; the unrelenting misery that is Man of Steel (I rewatched it a couple weeks ago at the suggestion of some friends, and my opinion of it worsened); Warner Bros and DC's general apathy over their own products, resulting in time tested quality control issues and passionless filmmaking, etc. etc (I could literally go on). But at least the Princess looks like she should. Hit the jump for more random stuff. I, along with many others, were not shy in voicing out disappointment in the recent Godzilla film. It, to put things simply, was not good. It's opening weekend was strong, but it dropped 77% the first week after that. But, like is so often the case now, the studio announced a sequel before the film was even released, so Legendary CEO Thomas Tull and director Gareth Edwards spent this year testing the waters as to what fans might like to see turn up in the sequel. Very basic footage, under the Monarch label that was the film's designation for Godzilla and his ilk, featured appearances by the pterosaur Rodan, the giant moth Mothra, and the three headed, two tailed, no armed dragon King Ghidorah, all classified under the banner "Conflict Inevitable." Tull went on to clarify that these are the three monsters under consideration for the sequel and that the follow-up won't necessarily become a remake of Ghidorah, the Three-Headed Monster. Legendary wasn't just about that one famous monster and his foes, but also brought a surprise to their display: the announcement that they will be producing a King Kong prequel called Skull Island, set for release in the fall of 2016. The last Kong outing was Peter Jackson's overly inflated and entirely monotonous 2005 retelling of the original, and all the tease suggested for Skull Island is that the island will be visited before Kong's removal, and Heart of Darkness will continue to be alluded to, because apparently in the long history of literature, that was the only time anyone every felt sad at sea. No word from Legendary if the film will be connected to Jackson's film, though I doubt it considering that Legendary didn't produce that film. Which might be a shame, because the best thing about Jackson's film was the companion book The World of Kong : A Natural History of Skull Island put together by Weta when they were designing the creatures and island, and is infinitely more interesting than the film is was companion to. Ultimately, I struggle to understand how Skull Island will be any different from King Kong, save without the emotional hinge of Kong's kidnapping and sacrifice (itself a poignant allegory of the treatment of slaves). 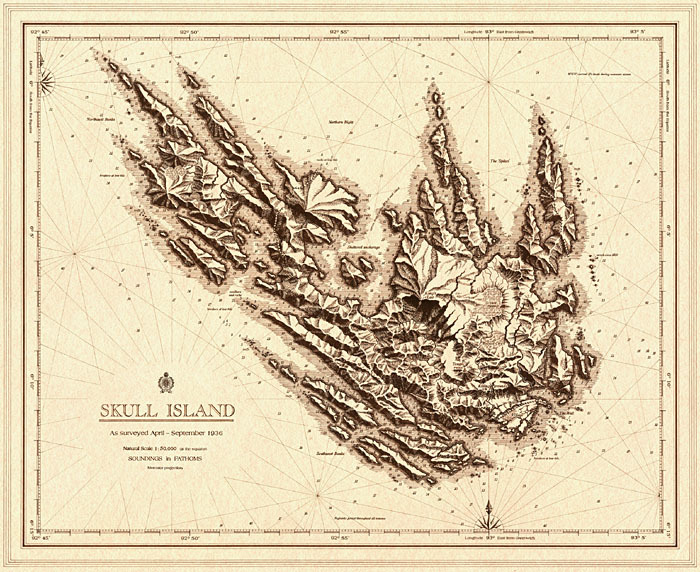 I assume that the film will involve the origins of the map that Denham obtains, in which case if the film is a period piece about pirates or 17th century English explorers being stranded on the island, during which time they massacre the indigenous ape population, leaving only Kong left alive, I might be willing to give it a chance. Otherwise, it's just pointless repetition with a recognizable name, in order to make a quick buck. The Hobbit had what will probably be their final panel (unless Jackson makes three Silmarillion movies a decade from now), and use the opportunity to pay homage to the entire sextilogy in the most meaningful way possible: they had Stephen Colbert moderate. Present was most of the Hobbit cast and Elijah Wood and Peter Jackson fielded questions concerning the tone of the renamed final piece of the Hobbit trilogy, as well as unveiled a saga-spanning blooper reel. 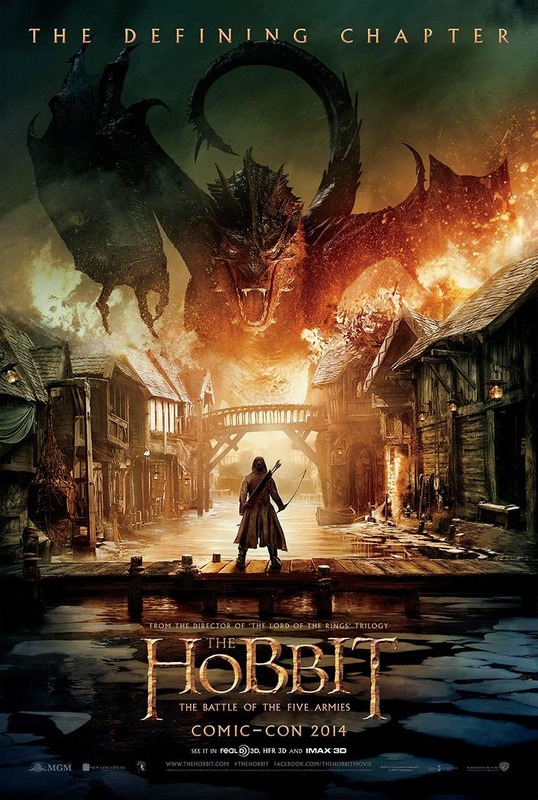 They unveiled the above poster, which proves they'll be plastering Smaug's mug over the promotions for this one despite him having a role roughly equivalent to Gollum in Unexpected Journey, which goes to prove that this "secret keeping" mentality that dominates big film making nowadays is getting in the way of sensible marketing. Smaug should have been the selling point for the last film (the one with his name on it), and Benedict Cumberbatch's Necromancer should be the selling point for this one. Beyond that, there wasn't anything new beyond the fact that the rest of us will have to wait a couple more months before we see a trailer. [Update: apparently not that long, as early Monday morning, the teaser was released online, and included below]. 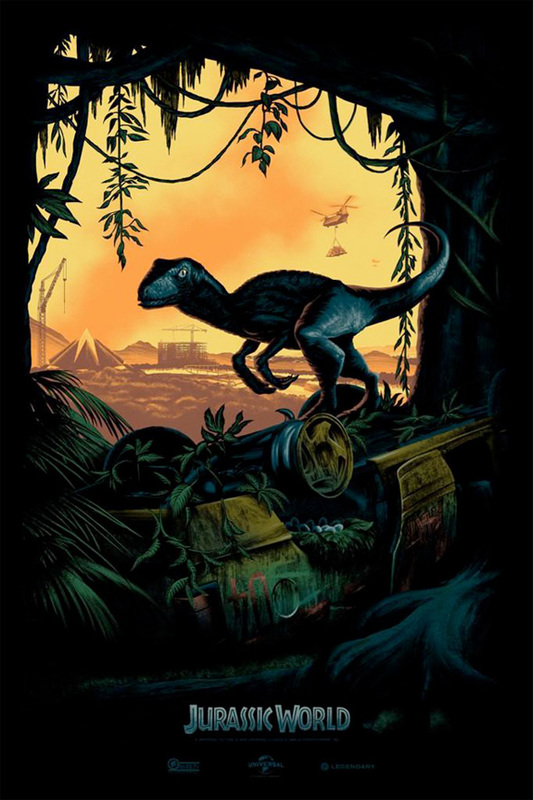 Elsewhere, Jurassic World was oddly absent from any of the panels, aside from a truck running around handing out copies of this poster. The film is in the middle of principle photography right now, and they've already lost Chris Pratt for two weeks while he does the grunt work for Guardians, so it's actually kind of refreshing that they didn't waste everyone's time with posturing, and are waiting until they've got something to show before they make a fuss. Though, it'll miss out on the convention circuit entirely by the time it's summer release rolls around next year.